Perhaps in the field of gastronomy more than any other, quality and value for money make a huge difference and only those who offer both at a very high level will last very long, especially in today’s market. 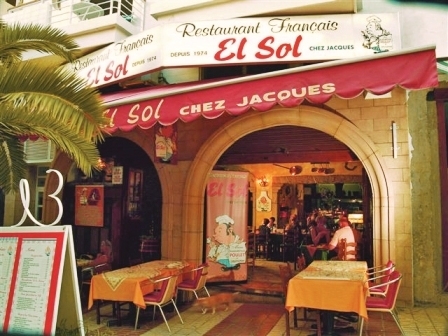 13.04.2014 - One such hostelry is the Restaurante El Sol in Los Cristianos which has been delighting and tempting its clients for the last four decades. It’s located in the heart of the old town: Follow the main pedestrianised street behind the old church and turn right at the chemist. The restaurant is on the left hand side in a short pedestrianised street which means outdoor dining is free of vehicle exhaust fumes. It was opened by Jacques Sabatier in 1974 and is one of the best and longest-established restaurants in the whole of south Tenerife. A complete perfectionist, Sabatier is also the head chef and the restaurant is highly respected for its inherent style, the quality of its cuisine and high standard of service, and is as popular as ever. And no wonder, as from the moment you walk in, it‘s obvious that here is an eatery that will offer a very different experience indeed. The restaurant’s harmonious interior is designed in the classic French style and the result is the perfect environment for a reunion with family or friends or romantic dinner. There is a wonderfully friendly atmosphere and every customer is made to feel welcome. As you are seated you are offered the traditional Kir Royale aperitif to sip whilst you enjoy making your choices from the menu. The range of dishes isn’t extensive, but is extremely interesting. Each is made to order on the premises as here, as in France, quality is most definitely the ultimate aim. For an appetiser you can choose between such delights as home made pate, Quiche Lorraine, a wide variety of salads, French onion soup or puff pastry with fresh asparagus. For main courses the restaurant offers traditional dishes from several different French regions, including chicken in Arlésienne sauce or a Beef Bourguignon fondue with six homemade sauces - those sauces being the cornerstone of the experience; each of them delightful and a great way to add endless variety. However, mayonnaise and ketchup are nowhere to be seen as, says Sabatier with the demeanor of one who really means it, “The use of those fast food ingredients in a gourmet kitchen is quite unacceptable”. One can see that here is a professional who takes his food seriously. To accompany your meal you can choose between several of the finest French and Spanish wines, including Beaujolais, Bordeaux and Alsace, as well as a wide range of soft drinks, coffee and alcoholic beverages. Those with a sweet tooth will definitely not want to miss the chance to try one of the absolutely delicious desserts. Choices include lemon meringue, almond cake, apple pie, and chocolate mousse – and each of them looks so good it is difficult to choose. Like all of the food on offer, the desserts are freshly made in the restaurant to the high standard you would expect. Yet the prices are extremely reasonable: snacks start at €5.50; main courses begin at €5.50 and those tempting desserts from just €4.95. Wines begin at €14.50 per bottle or can be bought by the glass. This is really one restaurant which is worth a visit: the combination of the interesting décor, considerate service and affable atmosphere with the excellent culinary delights will ensure that your dining experience is unforgettable. Arona. Call: 922 790 569 for more information and reservations. Produced with news.CMS in 0,0659 seconds.